Paris-Brest-Paris (also commonly referred to as PBP) is the most famous of all of the randonneur rides in the world. It is a 1200km ride starting near Paris, France, the furthest point riders go is Brest, then they return to Paris. The clock begins when riders begin in Paris and ends when they return. Therefore, the time they spend sleeping is part of their overall time. Riders also self-support so they bring tools and anything they may need in case of a flat tire or mechanical. They are able to stop for food periodically so they tend to bring front and rear saddle bags, but don't have the load that one who is touring would carry. Jan K. finished PBP in 2015 aboard the bike we worked with him and Seven Cycles to create. He supplied us with this image from his strong ride. This rider lives in Puerto Rico. We’ve worked with riders from all over the U.S. and world including California, New Jersey, Rhode Island, Vermont, Canada, Australia, Europe, and Ireland. There were quite a few Seven Cycles bikes at Paris Brest Paris four years ago, when the ride was last held. 2019 is a PBP-year so you’ll be hearing a lot about it from riders who are completing qualifying rides, dialing in their training, and getting bikes ready for the event. Seven Cycles posted about the ride and of Henry van den Broek's adventure there. We worked with Henry to design his bike which is a Seven Evergreen SL. We've worked on numerous randonneur bikes for PBP and randonneuring in a more general sense. Sometimes we don't stop to consider just how many bikes and riders we have on the road. After many hundreds of bikes that we've personally worked on in collaboration with riders and Seven Cycles, we've got quite a few to talk about and share with you. Photo of Henry during PBP 2015, provided to us from Henry. What considerations are there when we work with someone to build him or her the ideal randonneur bike? Note that many of these considerations are taken when we work with anyone on any kind of bike. Comfort. Long distances are only possible if the rider is in the right position, sitting on the right saddle, being jarred by the road as little as possible. Between working with our professional bike fitter to achieve the perfect bike fit to selecting the proper ride qualities desired for Seven's tube set selection, this extreme comfort is quite achievable. This Seven ExPat has a custom steel fork, Rohloff hub with belt drive and a lightweight rear rack. After this photo was taken, the bike received a generator light and hub to make it even more long-distance worthy. Note that a PBP-specific bike will have different design and component choices made. Bikes great for touring or for shorter randonneuring rides will look a little different than the ideal PBP bike. This bike, for example, shows off a lot of great features and functionality options, but wasn’t designed for PBP. Maintainability. When calling for roadside assistance isn't an option, it's important a rider is able to easily swap in a new spoke for a broken one, or fix a broken chain. For this reason, we usually hand-build randonneurs' wheelsets. We start with a higher spoke count to reduce the chances of a broken spoke. If one were to break, the wheel is often able to stay true enough to ride on safely. Using non-proprietary spokes makes replacing them that much easier. Light weight. The lighter the bike, the less effort it takes to propel it. Every bit of energy that can be saved is worth a lot. There has to be a careful balance struck between light-weight, comfort, and durable. There are a lot of ways to save weight that are worth considering. This is also quite person-dependent. Frame choice, rim choice, saddle choice are all places where many grams of difference can exist and can make a big difference. Functionality. Aside from getting a rider from point A to B, the bike can help a rider see and navigate by generating electricity in a front generator hub. When a rider is pedaling through the night, a generator hub and light wired to it is essential for seeing through the night. 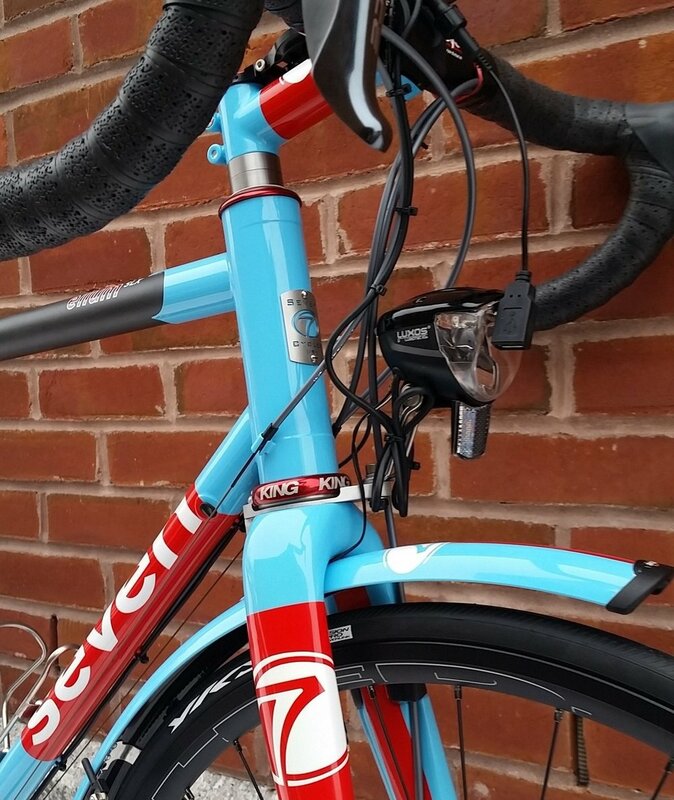 Lights such as the Busch & Muller Luxos U incorporate a USB port in a handlebar-mounted jack so as to charge small electronic devices such as a Garmin computer or cell phone. A rear light can be wired to the generator hub so the rider doesn't have to concern him or herself with being seen from the rear. There are great options on the market where it comes to generator lights that allow the bike to ride through the night, cast adequate light for the rider to see, and charge electronics such as the GPS computer and rider’s cell phone. Long-distance rides like PBP mean that almost nothing has enough battery power to last for the duration. When a rider is riding through the night and sleep-deprived, it is important to have the bike and its systems as simple and easy to operate as possible. The less the rider has to think about the better. Travel-ability. With around 6,000 people traveling to Paris, it is important to be able to fit into any taxi cab and travel as light as possible. Resources are slim when so many people and bikes show up to any one place. Rambouillet, the starting town, is no exception. The Evergreen bike in the background was just unpacked out of the case in the foreground in 30 minutes. This particular Evergreen traveled to France for another reason: to ride ALL of the cobbles of the Paris Roubaix course! Having an S&S coupled bike allows it to travel easily in a Co-Motion Co-Pilot soft-sided case. Packing and unpacking the bike isn’t particularly challenging, either. The bike checks on an airline for the cost of a regular suitcase with no additional fees, and it fits much more easily in Europe-sized cars, trains, and inns. Aesthetics. Aesthetics of the bike are important to almost everyone. What's right for one person is just that: right for that person. If someone is going to be riding for hours, days, weeks, and years on this machine, it'd better look appealing to get on! There's nothing like parking a bike by the side of the road and capturing scenic views with the bike in the foreground. Of course the bike has to ride well and work well. And there is no reason it can’t look exactly the way the rider wants it to look! Choosing colors, decals, even top tube slope are all ways to make the bike look the way a rider wants the bike to look. This S&S coupled Seven 622 S has a painted fork and unpainted frame, Chris King headset, bottom bracket, and hubs all match bringing the bike together handsomely. Every detail from the feel of the bar tape to the width of the tire is important. We have many years of experience with randonneur riders and randonneur bikes. Simply stated: we help riders get on bikes that go the distance 24 hours a day, seven days a week...without limitations and we don’t shy away from the hard work, detailed parts specs, and nuances that make your PBP experience awesome!